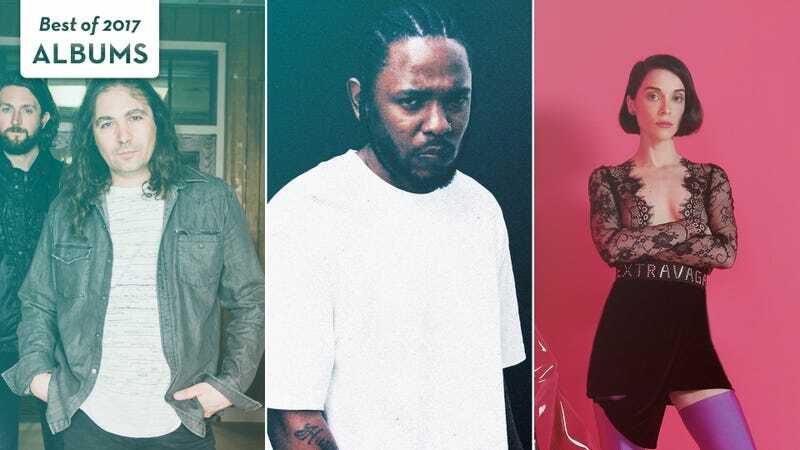 The War On Drugs (Photo: Shawn Brackbill), Kendrick Lamar (Photo: DAMN album art), and St. Vincent (Photo: Nedda Afsari). Graphic: Libby McGuire. There was too much to listen to in 2017—not just albums, of which there were once again thousands, a barrage of releases from major-label veterans and SoundCloud up-and-comers alike, all vying for your attention. There was just too much of everything: a persistent, buzzing storm of push notifications and free-floating panic that often made it difficult for any signals to break through the noise, or to retain whatever fleeting pleasures they yielded. It’s a year that’s often felt like 10, and you’d be forgiven for struggling to remember what, exactly, happened last week, let alone in the last 12 months. But the upside to chaos is that it’s equal opportunity. In a year that could have seen JAY-Z, U2, and Taylor Swift running the town in their UPS-branded trucks, or been overshadowed by prematurely nostalgic reveries from so many mid-’00s indie-rockers returning at once, most of the music The A.V. Club spent the past 12 months being excited about hailed from newer artists. And as befitting 2017, we couldn’t really agree on anything: The individual ballots submitted by our regular music reviewers were all strikingly different, representing a wide array of genre-spanning favorites and tastes. From there we assembled a final list based on total number of votes and album rankings, but even it—much like our mid-summer Best Albums Of 2o17 So Far list—is just a small sampling of all the great music that came out this year. Consider this a starting place on where to catch up, whenever you get a moment. And if you’re looking for even more recommendations, check back next week for our list of best albums that didn’t make the top 20.